Experience the passion in every bite! 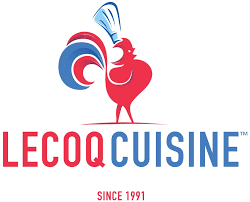 Lecoq Cuisine supplies Croissants, Danishes, Puff Pastries, Brioches and Hors d’oeuvres to the finest hotels and restaurants in North America. We are proud to be the “Standard of Excellence” within the industry. We use only 100% real butter and we have always been Trans Fat free. Our Connecticut plant meets the highest standards of cleanliness that surpass all industry and government requirements. Our Ready to Bake product line allows you to serve your clients in the most efficient way with no compromise to quality, just bake and serve! With our Proof & Bake products or the bulk dough and laminated sheets, you can concentrate on your personal creativity. Croissants: Plain, Chocolate, Almond, Raisin. Danishes: Apple, Blueberry, Cherry, Cream Cheese or Mixed Nuts. Hors d’oeuvres: Spinach&Ricotta, Bacon&Egg, Ham&Cheese. Brioches: Cinnamon Buns, Sticky Buns.